Salty cravings are a fact of life. Potato chips, french fries, popcorn: we love them all. But when the hankering hits, our go-to treat is a plate full of piping hot fries. But today we’re not here to talk about the merits of the classic potato french-fry. Because that’s not news to anyone. Today we are here to give it’s sassy cousin a bit of love: parsnip shoestring fries! While the classic french fry is topped only with salt, these parsnip shoestring fries are anything but ordinary. They’re seasoned to perfection, thanks to fresh thyme, granulated garlic, salt and peepper. All it takes is a few simple seasonings to elevate these fries to a whole other level. It’s fancy fries, without the fuss! Golden brown, delicious and totally addictive. And a super creamy vegan aioli that comes together in one minute flat? Yes, we’ll get to that too. Parsnips are one of our favorite root vegetables. While they look like carrots that have been kept out of the sun, they’re really delicious in their own way. Parsnips are slightly sweet and have a nutty, complex flavor. You can find parsnips in almost every grocery store (basically year round), and better yet, they’re quite inexpensive. Parsnips also happen to have a long shelf life, so if you’re one of those people who tends to dig up forgotten veggies from the bottom of the crisper, these are for you. What many don’t know is that some of the best flavor in a parsnip is just below the surface, so as a pro tip: avoid peeling parsnips if you can. This recipe calls for keeping the skin on for this exact reason. Not only is it more flavorful, but it’s also less prep work. A total win-win. We always opt for oven-baked when it comes to homemade fries. It makes them a healthier treat, AND it saves you all the work (and smell) of rigging up a deep-frying set-up at home. As you’d probably expect, oven baked fries can get crisp and golden brown, but they aren’t exactly the same as fries bathed in a vat of oil. To maximize the crisp on your oven baked fries, it’s helpful to use a large enough baking sheet (or baking sheets) to give the fries enough space to “breathe”. That way they can get golden brown on all sides. In this recipe, we recommend cutting the parsnips into thin shoestring sized pieces for more golden brown edges and a faster cooking time too. 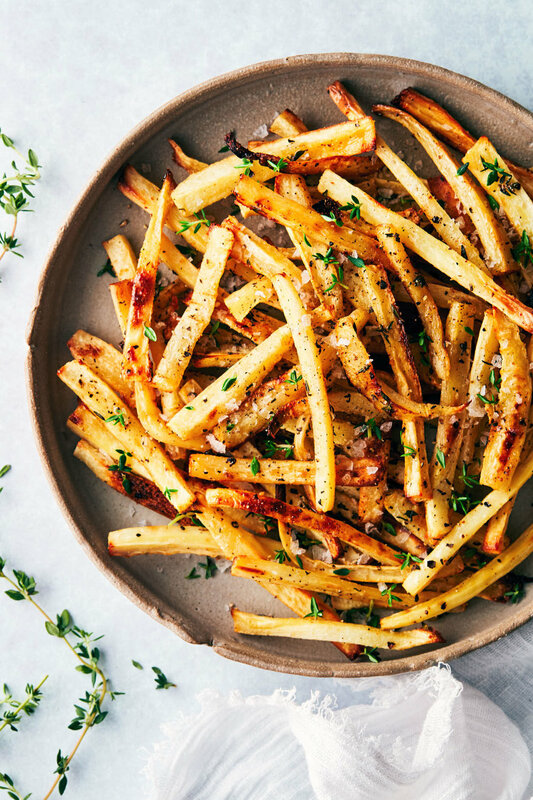 And since it’s shoestring fries, you get a lot more individual fries for dipping...into a super easy Vegan Dijon Aioli sauce (or whatever dip your heart desires). Give it a whirl. We bet you’ll fall in love with these homemade parsnip fries. And trust us on the aioli: these parsnip shoestring fries are made for dipping! Preheat oven to 450°F. Line one large (or two regular) baking sheets with parchment paper. Make sure to give the parsnips a good scrub in the sink (no need to peel). Cut the top off the parsnips, then cut into thin shoestring pieces: about ¼” thick and 3” long. Once cut, put all the parsnip fries onto a single baking sheet for now. Drizzle oil over the parsnip pieces. Toss until the parsnips fries are evenly coated with oil. Sprinkle fresh time, garlic powder, salt and black pepper over top. Stir to mix. Once seasoned, spread the parsnip fries out so that there’s space in between the fries (this helps them brown). If you’re using a regular sized baking sheet, split the parsnip fries across both sheets. Bake in the oven for 25-35 minutes, flipping half way. Remove from the oven when golden brown and edges are starting to crisp. Garnish with extra salt and fresh thyme, to taste. Serve warm, with Vegan Dijon Aioli for dipping.